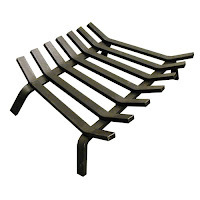 If you are looking for a new fireplace grate, you now have a variety of options to choose from. You may be wondering how to decide which one to choose. A smaller, less expensive grate may be fine if you only use your fireplace occasionally. If you are like me and love to have frequent roaring fires on the cold winter evenings, you will probably want to invest in a more durable grate. As a general rule, the heavier the grate- the longer it will last. When sizing for a fireplace grate, you should leave between 2-4 inches of clearance on the left and right side of the grate. If you have fireplace doors, you will want the grate (and the fire) to be at least 6-8 inches back from the glass. Inevitably, the fireplace grate will be positioned close to the back wall of the fireplace. If you are concerned about fire damage to the brick and mortar on the back wall, consider getting a fireback. A fireback, such as the Great Oak Fireback, is a cast iron plate that does a great job of protecting the back wall from fire damage, but is also decorative. Grates are usually made out of either steel or cast iron. Many are designed in one piece construction, which means you will not have to worry about losing any small parts or getting your hands dirty. Simply take it out of the box, place it in your fireplace and you’re ready to go! The Traditional Fireplace Grate is one such grate. If you are looking for a grate that will not burn out in a couple of years, then a great choice for you is the Lifetime Fireplace Grate. This heavy duty grate is thicker and heavier than the typical grate. 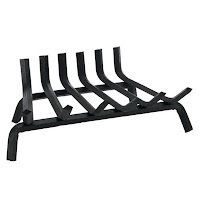 Made of 1” wide steel bars, this grate is designed to withstand the harsh environment of your fireplace. You can relax with confidence knowing that you will never need to buy another grate again. The Lifetime Fireplace Grate also comes with a lifetime warranty. If you were ever to burn through the grate, simply contact the manufacturer for a replacement. It's a little more expensive then most grates, but it will be the last grate that you ever have to buy. Along with your typical fireplace grates, there are newer styles like the non-tapered grates and the self feeding grates. The self-feeding grates have a deeply contoured design which continually lowers the burning logs to the grate ember bed. This also assures that logs will not tumble out onto the hearth as they shift and burn, helping to eliminate unwanted fire hazards. The non-tapered grates have the same width in the front and back which are ideal if you have a two-sided or see through fireplace. Remember when sizing for your grate to leave 2-4 inches of clearance on all sides of the grate. When choosing your grate, you will also want to consider any fireplace equipment that will be placed under your grate, such as gas fire starter pipes, fire back feet, or andirons. If you have a gas fireplace or a gas starter pipe, take into consideration the clearance height of the fireplace grate before you buy. You will want to make sure that any gas pipes can fit underneath the fireplace grate.